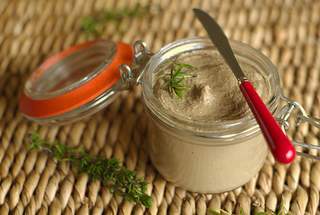 (This Creamy Chicken Pate can be kept in the refrigerator for up to 3 days, or frozen for up to one month, prior to using - although it is always best served immediately). Fry livers in butter for about 5 minutes, stirring. Add garlic, brandy, sherry and ignite the mixture, leave until flames subside. Process mixture until smooth. Stir in the cream and salt and pepper.